Company has received a $40-million contract for. the construction of barges and towboats, it was an- nounced by Jacob O. Kamm, presi- dent. "This is the largest single con- tract ever received by our Nash- ville Bridge Company, the division which will build the barges and towboats," Mr. Kamm said. H. Barton Jr., president of the divi- sion, said. Services as manager of marine de- sign. During more than 30 years in na- val architecture and ocean engi- neering, Mr. Friedland has contrib- uted to a variety of advanced ma- rine design programs, including the development of hydrofoils, wet and dry manned ^submersibles, surface vessels for offshore exploration and research, and underwater automa- tion. UCLA in 1973 as a part-time lec- turer for a course in the design of mobile offshore drilling units. Cooper Union Institute of Tech- nology,'New York, and a master's degree in mechanical engineering from Stevens Institute of Technolo- gy, Hoboken, N.J.
Fe's marine capital projects, includ- ing four drilling vessels and a pipe- laying barge currently under con- struction. Petroleos del Peru, Peru's state oil company, has purchased a tugboat and five barges to transport crude oil on the Amazon River to Brazil, accord- ing to an announcement by the com- pany's Houston, Texas offices. Orleans, La., for about $2 million. The company has a contract to sell 5,000 barrels of crude a day to Petro- bras, Brazil's state oil company. Petroperu wells in the Oriente area. 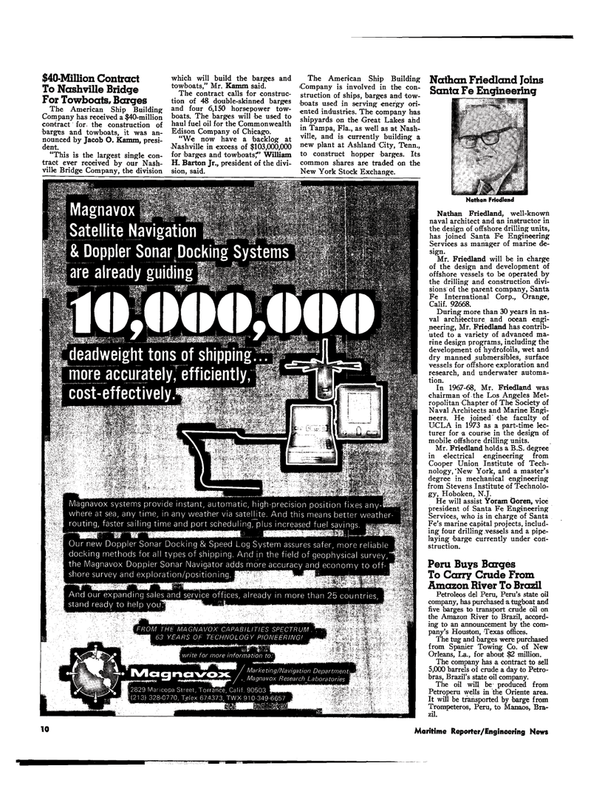 Magnavox systems provide instant, automatic, high-precision position fixes any- where at sea, any time, in any weather via satellite. And this means better weather routing, faster sailing time and port scheduling, plus increased fuel savings. Our new Doppler Sonar Docking & Speed Log System assures safer, more reliable docking methods for all types of shipping. And in the field of geophysical survey, the Magnavox Doppler Sonar Navigator adds more accuracy and economy to off shore survey and exploration/positioning.